I’m curled up in bed, nose running, eyes watering, mouth-breathing, waiting for one last load of diapers to finish so I can get in the shower. We’re all packed, aside from those few last minute things, which means of course all our suitcases are still lying open in the hallway. At least, in a holiday miracle, I managed to clean [most of] the house. We’re leaving town tomorrow for a month of travels: a probably-annual trek down through Ottawa, Pittsburgh, and Maryland. Which we can’t wait for, because May was a total jerk. Lots of grey skies and snow, but I didn’t mind that as much as the unceasing stream of minor illnesses. I managed to mostly avoid the plagues, but the last couple of days it finally hit me. The exercise of packing for a month’s travels while a sniveling wreck has been uniquely invigorating for my faith. The long and short of it is, I am a very bad charity knitter. I super-enjoy going to the ACW (Anglican Church Women) groups on Monday nights, and the ladies there churn out a prodigious number of knitted, sewn, and crocheted items to sell at various craft sales throughout the year to raise money for the cathedral. At first, not knowing what was going on, I just brought my own knitting. But one week – I remember it was early February because it was when I brought my mom along – when the giant bins of yarn came out, I picked out something interesting. It was just two balls of boucle, but it obviously wanted to be more than that. 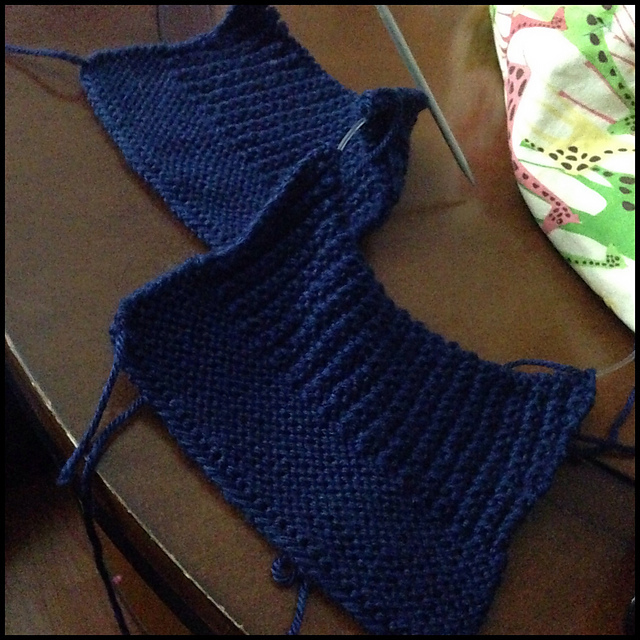 Mom gave me some stitch markers, I made a guess at a good number of stitches to cast on for a top-down baby sweater, and away I went. For a couple of months, I just worked on it when I was at meetings. When a couple months passed and I wasn’t yet through the yoke, I realized this sweater might be ready for a baby conceived in the next decade. So I took it home, found a pattern to check my guesstimated measurements against a real pattern for a 1-year size, and made a proper effort. Baffin Electronics had some smashing little pink buttons, so after a few more months, voila! The neck is a little small, but it will either be sort of french-style, or will be worn with the top button open. Hopefully the 1-year-old who gets this will not have a 3-year-old sister who is completely neurotic about having ALL BUTTONS BUTTONED AT ALL TIMES. I managed to get it done in time for ACW’s closing party Tuesday night, which involved epic quantities of awesome country food, hilarious games with lots of laughing and running around… you know, all the things that make Inuit parties the best parties. I have been so grateful to be accepted by this group of ladies, despite my very beginner Inuktitut, so handing in my small contribution for the next craft sale felt important. I think this is the start of a pretty serious baby sweater jag. At any rate. I can’t seem to get it. Sorry I haven’t replied. I will have to dig up my gooseberry pattern to look at what you’re saying. Email me osbornfiber at gmail dot com if you’re still having issues.